... And I ain't talking 'bout no postage stamps... But side note, how expensive are postage stamps these days? I remember back in the day when they were 30 cents. For a correspondence enthusiast like myself, I spend way too much on stamps. But I digress. What I'm really talking about are fun crafty stamps! Found at craft-store havens like Michaels and Paper Source, stamps come in every letter, number, holiday theme and clever phrase you can think of...the list goes on and on! With a plethora of ink pad colors, you can make anything your creative little heart desires. 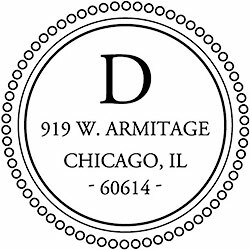 From hand stamped napkins to place cards to greeting cards, get your stamp on! 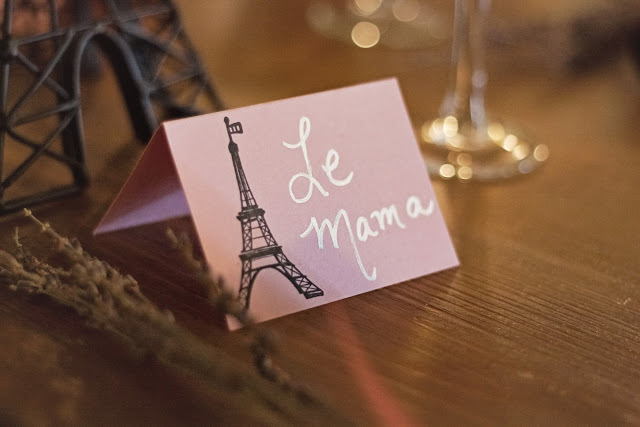 I used an Eiffel Tower stamp for the Parisian Chic Luncheon to dress up simple place cards. I made plain white napkins adorably festive with a gingerbread stamp for our latest Cookie Exchange Party. Return address stamps are all the rage these days. I was gifted one for Christmas this year and I LOVE it! Here's a cute model from Paper Source. 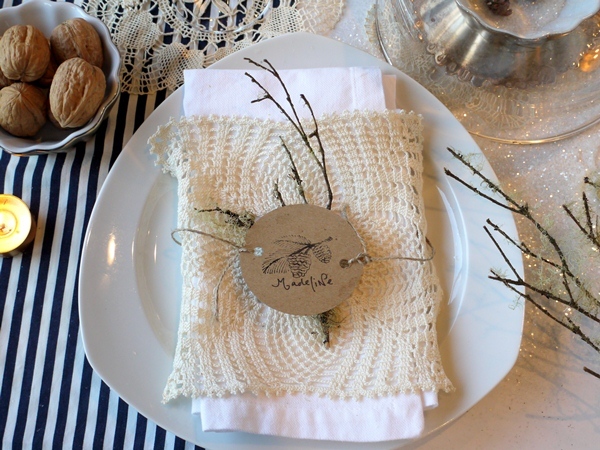 These customized place card stamps are perfect for a winter dinner party place setting. In fact, I adore these entire table setting! 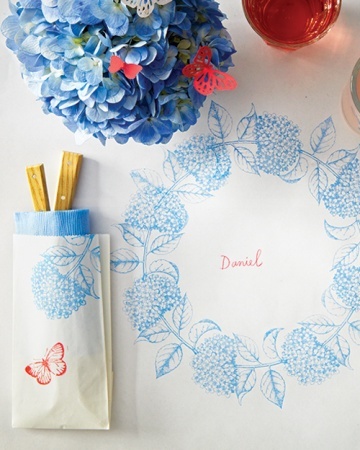 This stamped paper tablecloth is another creative way to dress up a table setting with stamps. Martha does it again! 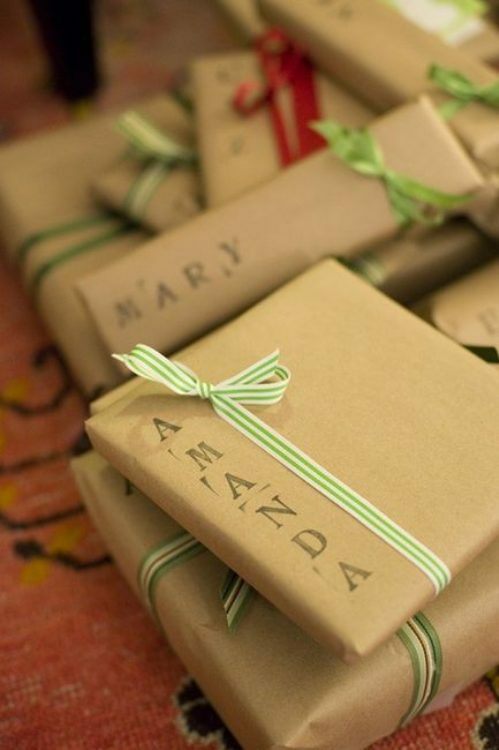 These large letter stamps jazz up brown kraft wrapping paper with a personal touch! If you still partake in the old fashioned handwritten note (like myself), pick up some stamps from the dollar bin at your local craft store (these are from Michaels) and add a design to plain white notecards. Not only will people love getting mail that's not bills, they'll love your extra effort. Plus, stamping is fun. And it's not for dorks like you may think. Stamps are cool. Non-homemade non-stamped Valentine's Day cards are lame-o. Said me. So spend a few bucks and get creative with stamps. They'll spice up your table setting, notecards and people will be impressed with your mad crafty skills. For reals. I’ve thought about joining in on stamping fun, but I have way too much junk as it is. Definitely enjoy looking at these pretty pictures though! I used to be a big stamper, but have sort of gotten away from it. Maybe its time to pull them out again. Paper source does have the best stamps, you are right about that! And omg -- for a big party you can spend SO much on postage stamps! !